I am quite sure that the weather is a significant consideration when most people begin searching for potential destinations for a weekend away. 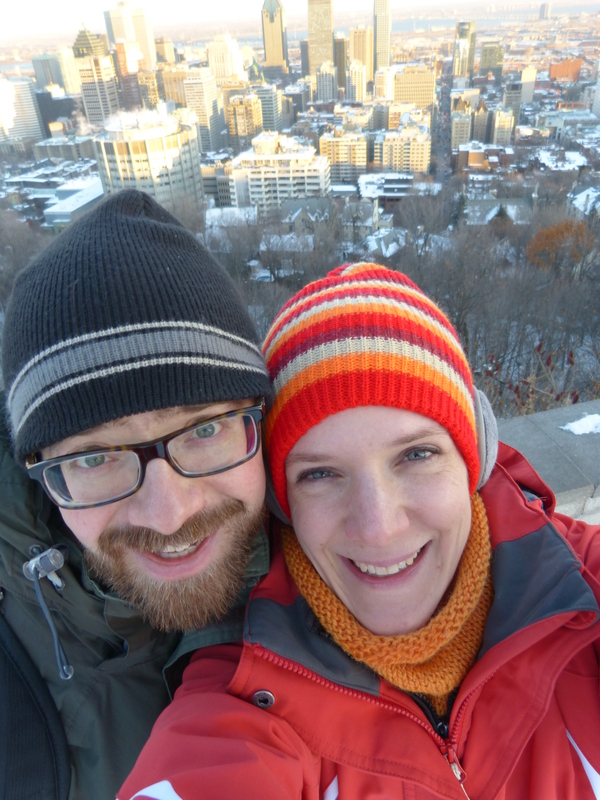 However, for those of us for whom even today’s weather poses a challenge, that sort of forward planning is a step too far, and so it came to pass that Tom and I found ourselves landing in Montreal in subzero temperatures (thankfully C, not F). Fortunately, several years of ski holidays have supplied us with a plethora of gloves, hats, thermal baselayers etc., and we were further warmed by remembering all the money we had saved by not choosing to go somewhere sunny. Arriving on Friday in time for a late lunch, we ate very well in a vegan gluten-free cafe on Mackay Street before heading up to the Parc du Mont-Royal via Rue Sherbrooke and Rue Peel. Whilst there wasn’t much snow left on the streets below the park obviously hadn’t been cleared, and we had a wonderfully wintry walk to the main viewing area. 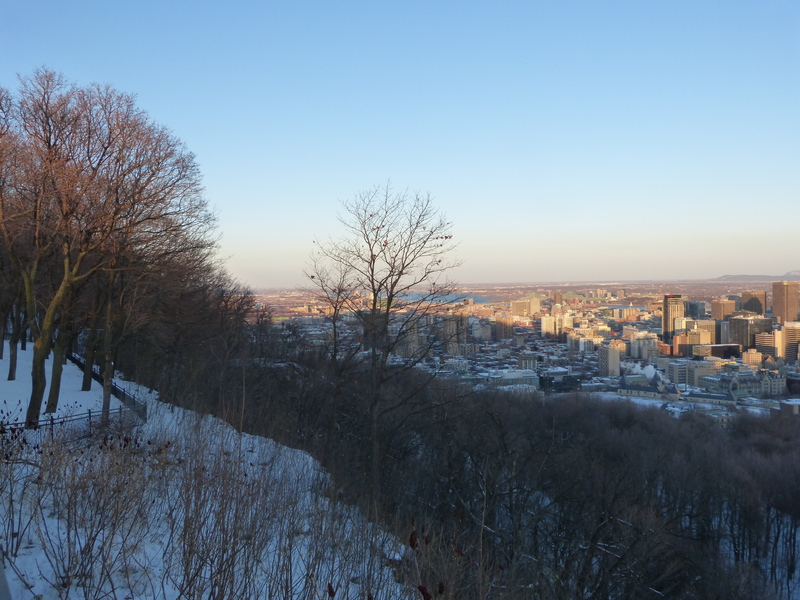 It was too chilly to linger for long, so we hatched an (it turned out) ill-advised plan to walk to the other end of the Mont and visit the Oratoire St Joseph. Deceived by glimpses of its dome through the trees, and misled by the lack of scale on the guidebook map, we trudged a long way through the snow, leaving the park to pass the undeniably scenic but seemingly endless rows of gravestones in the aptly-named Notre-Dame-des-Neiges cemetery. Eventually reaching our destination, we admired it from the bottom of its approach and then hurried for the underground. Back at the hotel, we warmed up in the pool and sauna, then ventured out into the tunnels to buy a picnic supper. Neither of us were too keen to go back out into the cold, and with a great view of the city from our room on the 22nd floor an evening in didn’t feel like a bad option. Saturday dawned somewhat warmer (just a couple of degrees below freezing, I believe), and we fueled up for the morning at a charming brunch spot in Old Montreal. As we waited for our food we remarked upon how very French it all was, and this was to remain a theme of the weekend – in most places we were at least greeted in French, and whilst many people switched to English once they realised we were tourists that was not always the case. 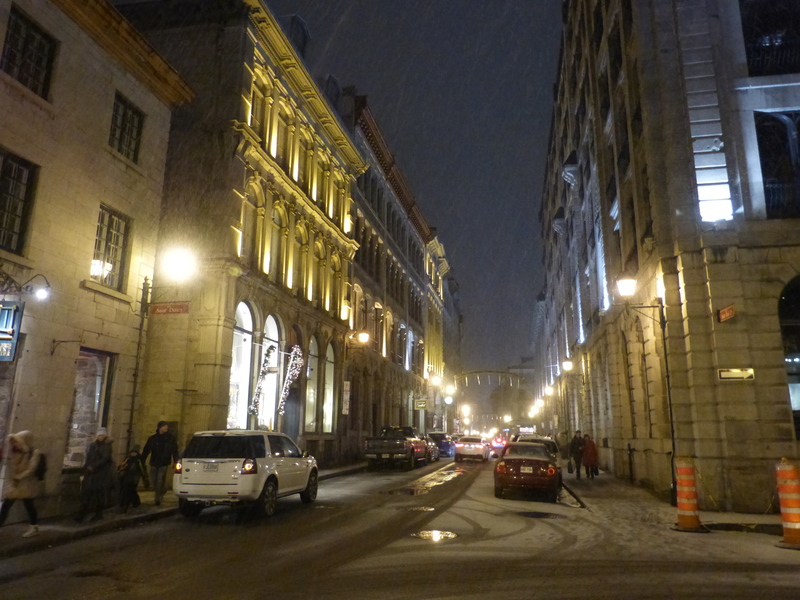 Personally I rather enjoyed dusting off my French, and it certainly made the weekend feel a lot more like proper travelling (in a way that our otherwise comparable trip to Toronto did not). 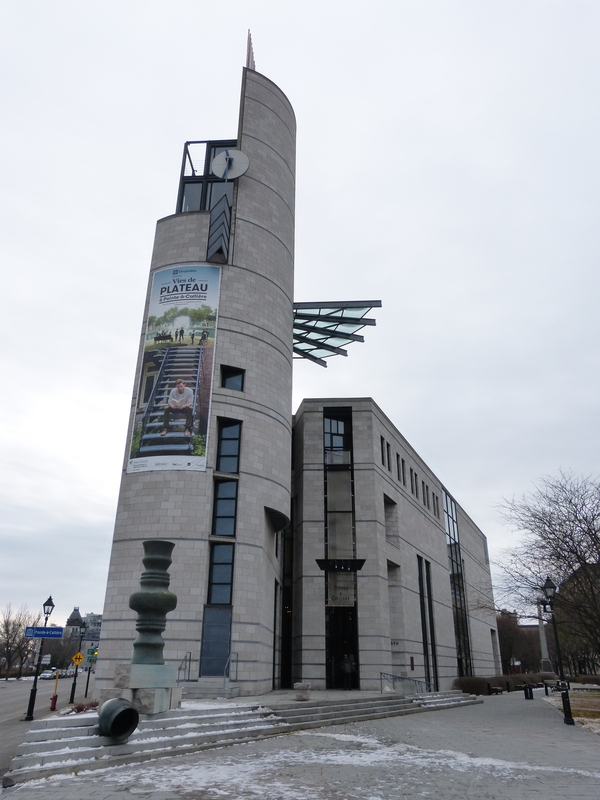 The plan was to spend the whole day in Old Montreal, and our first stop after breakfast was the Pointe-à-Callière museum. This was really excellent – definitely a highlight of the trip. 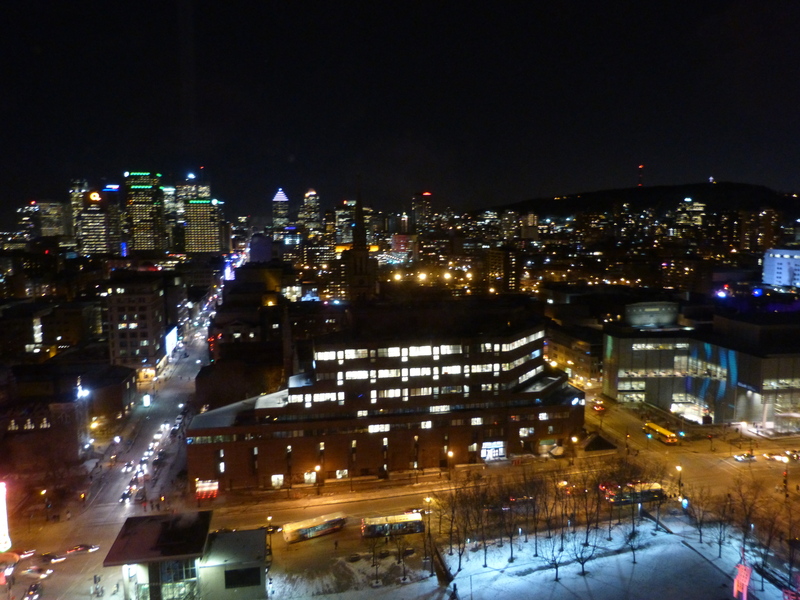 We began in a temporary exhibit about the Plateau district of the city (of which more later), and then watched a screening of their multimedia show which covers the entire history of Montreal and its environs. 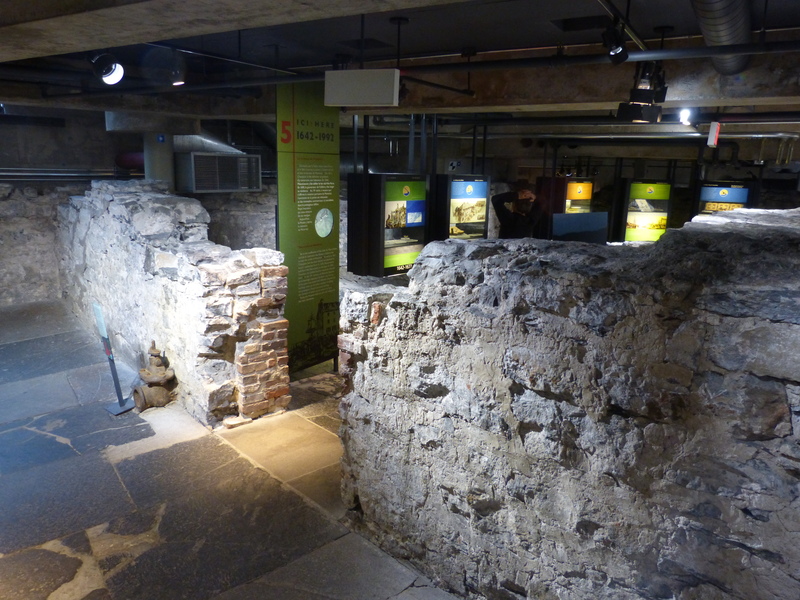 After the film we followed the route through the foundations of the building, which took us out under the square via archaeological remains from several different periods. Back above ground we emerged into a different building where we enjoyed an entertaining exhibit about pirates and (of course) the museum shop. 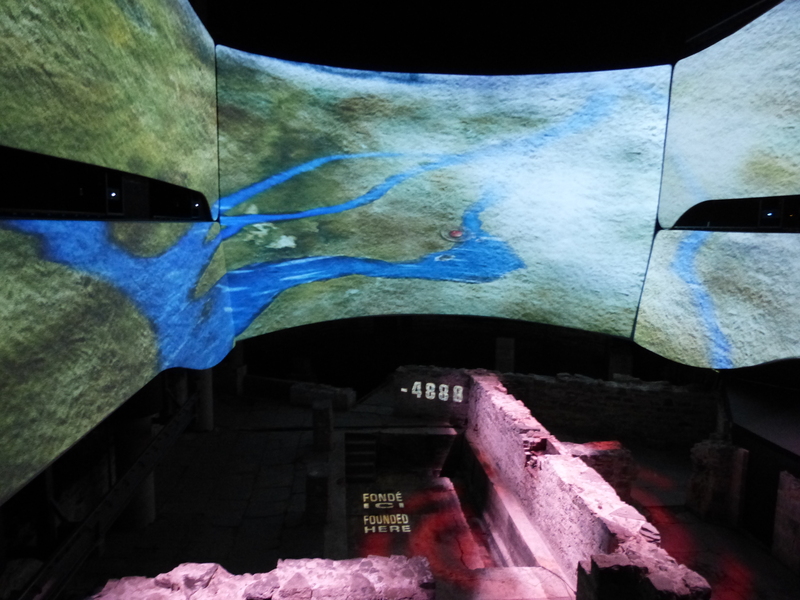 Along the way we learned about how Montreal developed from the site of a major Indian settlement into a prosperous colonial hub, with the various stages illustrated by archaeological finds, models, art work and multi-media displays. This is a really excellent museum, and we spent a lot longer there than we expected to, which is always a good sign, I feel! 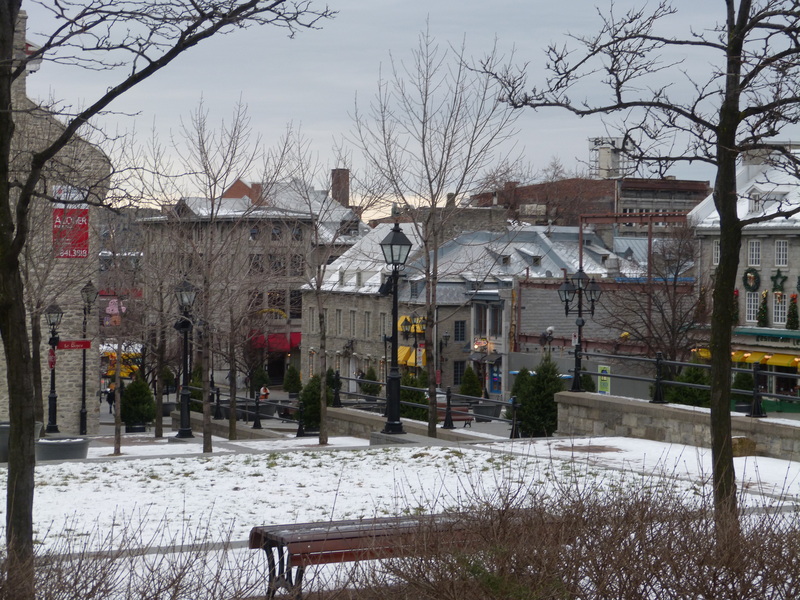 Then it was back out into the chilly afternoon for a brisk walk around the Old Town. A mixture of old-and-quaint and modern-and-less-quaint buildings line the narrow streets, and it really does feel like being in a small European town. The stonework is rather grey, and on a steely November afternoon it probably wasn’t looking its best, but there were plenty of cute little artsy shops to pop in to when we felt like warming up a bit. 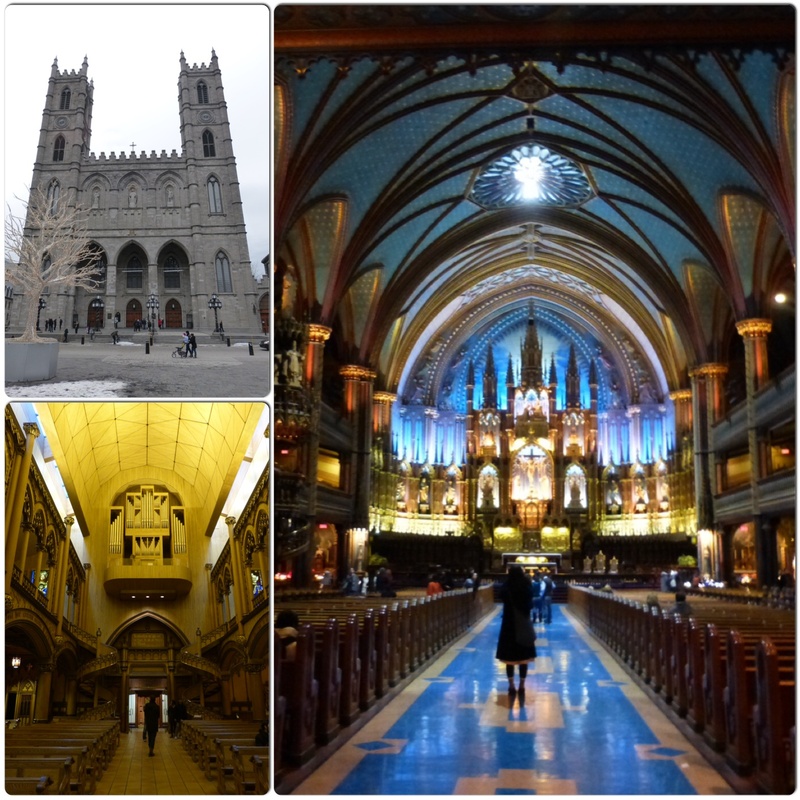 A quick stop in a cafe was very much appreciated before heading into the Notre-Dame Basilica – an impressive Gothic revival style church dating from 1829. The ceiling was rather beautifully decorated with gold-leaf stars on a dark blue background, and I found the other decor much less oppressive than is often the case in big Catholic churches. Wandering into the chapel we were startled to find it characterised by a radically different style, which we learned was the result of a total refurbishment after a fire in 1989. Back outside and with some time to kill before dinner we quickly found a bar, and settled down with a most welcome glass of vin chaud. Whilst we warmed up, the snow began to fall, so when we came to leave the streets were covered with a light dusting – what with that and all the festive lights everywhere we could have been in a Christmas card, and it was rather lovely. Dinner was excellent – gluten and dairy free pizza has never tasted so good (and no, it wasn’t just because of the wine!) – and whilst Tom’s dessert was probably one of the most unappetizing-looking things I’ve seen on a plate it was actually quite delicious! 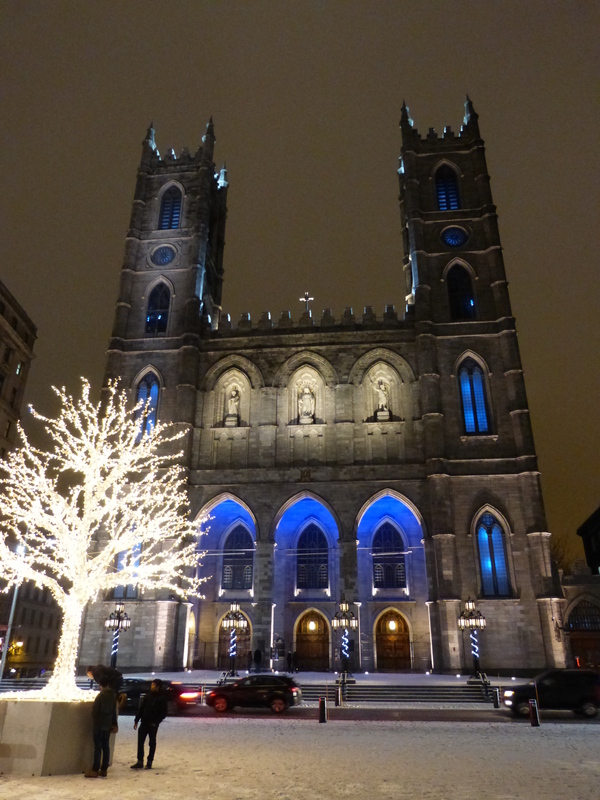 We concluded our evening with some more walking through the snowy streets, back past the Basilica, before heading underground to continue the walk in the warmth of the tunnels. Our route took us through a variety of different areas – from slightly unsavoury looking pedestrian subways into a cavernous and rather glitzy shopping mall / arts centre complex. At this point we decided that enough was enough for one day, and caught the subway back to the hotel. 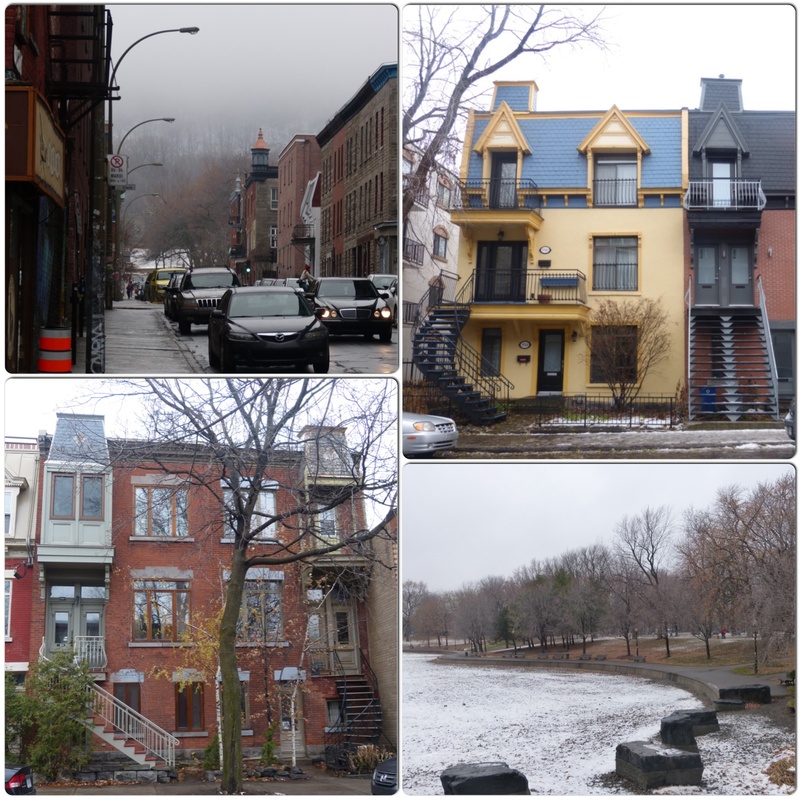 Sunday morning was warmer but still rather gloomy, and we walked from the hotel up to the Plateau neighbourhood. We followed most of a walking tour route, along residential streets and shopping thoroughfares which reminded us very strongly of south London, and into another wintry-looking park. I’m not entirely sure what the purpose of the route was, as it seemed not to pass any buildings of particular historic or cultural interest, but we certainly had a good feel for the area afterwards. Both our first and second choice cafes turned out to be closed on Sundays, but we finally found a delicious lunch in yet another vegan gluten-free restaurant before collecting our luggage and catching the bus to the airport.Had the weather been either nicer or snowier I think we would have wanted to stay longer, but as it was we both felt like we’d seen a good amount of what Montreal had to offer (although I hear they have a great jazz festival in the summer…). 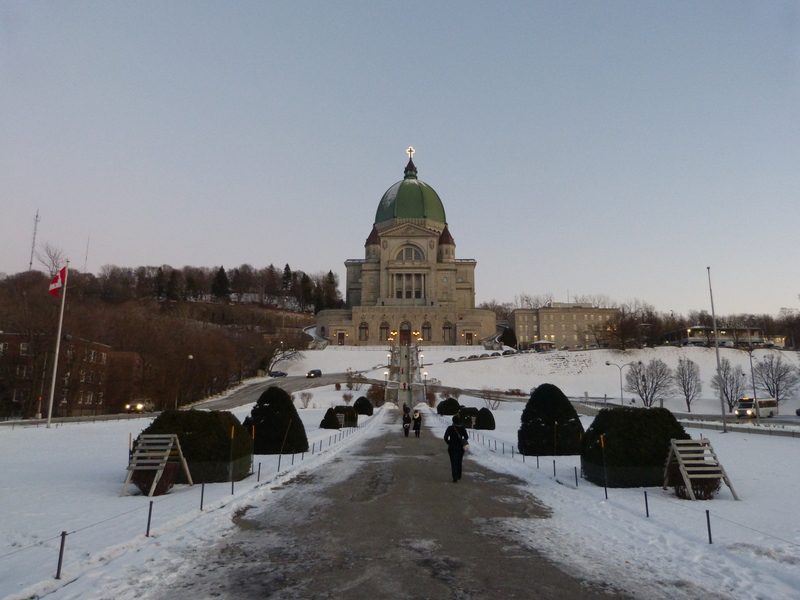 I’ve been busy recommending it to a variety of friends and colleagues, and would certainly be happy to go back one day (although I think Quebec City is probably next on the short-visits-to-Canadian-cities list!). As ever, there are more photos over in my Flickr album for the trip, in case you’re interested. This entry was posted in Exploring, Food and drink, Holidays, Museums/galleries and tagged Cafe Verdure, cookie Stefanie, Crudessence, French, gluten free food, gluten free Montreal, Hotel Gouverneur Place Dupuis, Le Cartet, Mangiafoco, Montreal, Pointe-à-Callière by Emma Davidson. Bookmark the permalink.